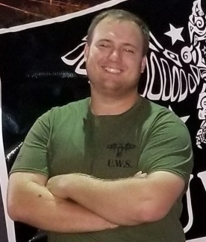 Jacob Harbison | United Warrior Services, Inc.
Jacob Harbison is a Veteran Supporter. He works as a Chemical Engineer and Consultant. In his free time he works with United Warrior Services to help out Veterans and provide logistics support, fundraising, corporate outreach, and organized donation support to their mission. He is an integral part of the UWS mission and adds immeasurable support to the organization.